It's Valentine's Day, and I'm home with my Valentine starting off a wonderful Seafood Dinner with Da Morgada Portuguese Sardines in Tomato sauce. This is my first venture into saucey sardines. I picked these up at the Bowl, and have seen them at Whole Paycheck. They are Fancy, I guess. I got two cans, one for eating and one for Fritters. This is the first time the pull ring has come off the can. Not a problem. Four large fish in a nice sauce. I didn't drain off this red goodness. Aaand, I got one and a half. My Valentine seemed to really like these. 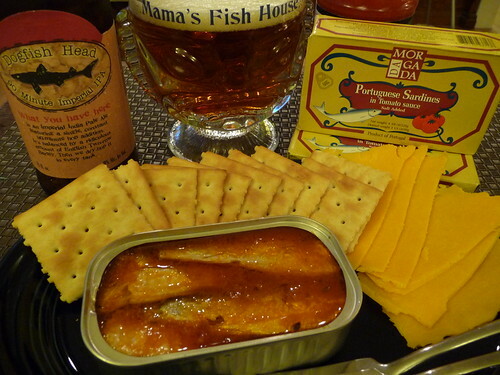 She was against saucey sardines at first, but this tastes like a good saucey starting point. The sauce is mild with only a hint of oiliness. The ingredients list hot peppers, but again, I can't taste any heat. A little salty. Fresh tuna taste. Quite descent, but I'm only giving them Three out of Five Tins. I wouldn't go there again, but might be trying their other three flavors. What you have here is an Imperial India Pale Ale featuring a single constant 90-minute hop addition. It's balanced by a ridiculous amount of English Two-row Barley. Then we dry hop it in every tank. It's pretty good, not Terminal or anything. I'll make the Fritters another day. 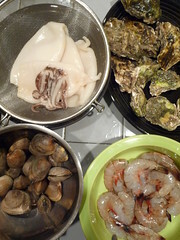 We're moving on to Champagne, Oysters on the Half, Frito Misto of Fresh Calamari, Portuguese Clam Stew, and more Champagne.